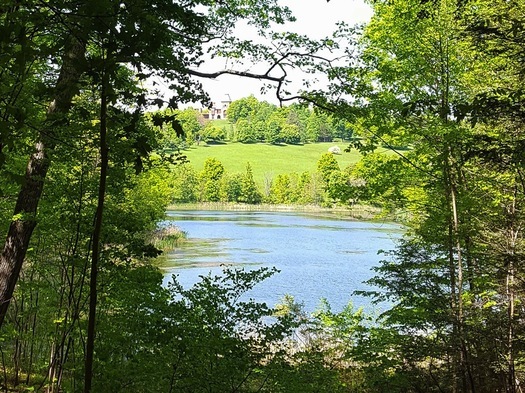 Emily sent along this photo from one of the carriage paths as an example -- the lake, meadow, slope, trees, and house were all part of Church's design. The Olana State Historic Site in Hudson -- the home and studio of Hudson River School painter Frederic Edwin Church -- has a new tour this season, and it highlights an aspect of the site that was new to us: That the area around the beautiful home is itself a designed landscape. The guided electric vehicle tour follows roughly five miles of the carriage road system on the 250-acre site, surveying the various landscape elements that Church designed. Frederic Church wasn't just a landscape painter, he was a landscape architect and the entire 250 acres of Olana is a designed landscape, a three dimensional artistic composition. It's like Disney Land for Art History fans. There are certain key points on the landscape tours where its exceedingly clear one is essentially inside a living Hudson River School painting, that Church used all the effects he would use in a painting, having a foreground, background, focal points, negative space, by using physical characteristics -- like creating meadows, wilderness areas (planting large amounts of native trees), and an artificial lake, and borrowing other effects including the changing weather and unfolding background views of the Hudson River and Catskills, to create the same feelings in 3 dimensions as one would have in response to his 2 dimensional artwork. Church was appointed a parks commissioner for Central Park in 1871, brought in by Frederick Law Olmstead and Calvert Vaux, and in a sense the whole of Olana is like Central Park with various landscape features that don't just happen to be that way, but were designed that way on purpose by the artist. Much of Church's original vision has been restored through a private/public partnership between New York State Parks and The Olana Partnership, and the work continues. So much was also remarkably intact as well in terms of land, art, and archival collections at the time Olana was saved 50 years ago. The electric vehicle tour is intended to provide a similar experience of the landscape as visitors to Olana had in the 19th century when they would ride up to the house in carts pulled by donkeys. The Olana landscape tours are offered Fridays and Sundays at 11:15 am and 2:15 pm. They're $25 per person. Reservations are recommended. There's also a guided walking landscape tour on Tuesdays and Saturdays at 11:15 am and 2:15 pm -- tickets for that are $12 / $10 students and seniors. * Emily has written for AOA in the past. And a new WMHT program on Olana premieres May 31 at 7:30pm.